The upgraded software includes extra "Pop," "Songwriter," and "Latin" Drummers, according to Apple. New Drummer loops can be added to a song and tweaked using performance controls. The pitch of an audio region, meanwhile, can now be tuned or transposed, and individual steps in the Arpeggiator plug-in can be changed. Alchemy improvements include additive effects, and an automatic time align feature for morphing. Apple is also promising a more responsive user interface in general, and fixes for Low Latency Mode beyond the first two outputs. Lastly, volume automation should reset as intended when a cycle starts over. For existing owners, the update is a free download through the Mac App Store. 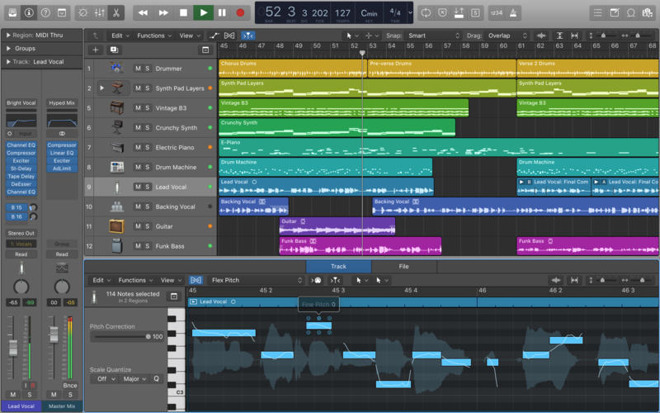 Logic Pro X is $199.99 new, and requires OS X 10.11 or later.